When you write a class implementing an interface or extending a super class, it is often the case that the API is identical. It would be nice to inherit the JavaDoc documentation, which is possible. The JavaDoc documentation notes that missing @param and @return values are inherited implicitly since JavaDoc 1.3, but I have never noticed this in Java6. The above explicit markup is confirmed to work. 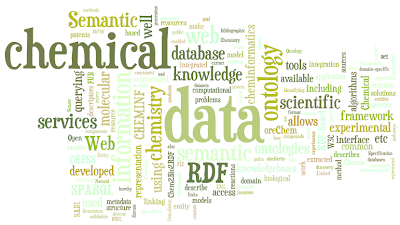 If you are new to Resource Description Framework and related technologies, I can recommend the book Programming the Semantic Web , which I read with pleasure. The workflow paradigm allows scientists to flexibly create generic workflows using different kinds of data sources, filters and algorithms, which can later be adapted to changing needs. In order to achieve this, library methods are encapsulated in Lego(TM)-like building blocks which can be manipulated with a mouse or any pointing device in a graphical environment, relieving the scientist from the need to learn a programming language. Building blocks, so-called workers, are connected by data pipelines to enable data flow between them, which is why pipelining is often used interchangeably for workflow. Taverna is not the only open source workflow environment, but certainly gotten a lot of visibility in the eScience communities in at least The Netherlands and the UK. There exists other workflow environments too with CDK nodes, including KNIME which is since version 2.1.0 licensed GPL3. Thomas uploaded some 17 example workflows to MyExperiment.org, to give you further idea what the system can do. Development has gone down considerably, since Thomas finished his thesis, and if you like to work on the CDK-Taverna project, and be the next Dr Who, please contact me, Achim or Christoph. I started experimenting with CDK nodes for Taverna in 2005 (see CDK-Taverna fully recognized), and would love to see it live on. Andreas and I made an attempt last December to port things to Taverna 2.1, and the code we worked on can be found in this GitHub repository. I noted today that blogger.com, the blog service provider I am using, had new templates. I was getting tired of the old one anyway, so tried the simple template using the usual orange: quite satisfactory! At least, beats buying a book like this Blogger: Beyond the Basics . Don't have time for that. Actually, of the 73 visits with IE6 in the past 30 days, only 12 were hits of regular visitors. So, could I please ask this one visitor to email me offline if upgrading is not an option? PMD is a tool to run some tests against your source code. The check for code style, common problems, and places where code could be improved. The CDK has been using it for years now, such as here for CDK 1.3.x. The custom.xml defines the tests we normally run. The first week of August I will attend the eCheminfo Predictive ADME & Toxicology Workshop (LinkedIn Event) for which I received a Bursary Award. It will be my first time in Oxford, and I am very much looking forward to it! The meeting is also bound to be fun. I have not done much in the area of toxicology other than the more general QSAR/QSPR model building with chemometrics. But I have been recently taking to Nina and other of the OpenTox community, and started to play a bit with the data and computation API they are developing. service, dataset, "/OpenTox/ambit" + dataset + ".sdf"
Behind this plugin is again the RDF plugin, as OpenTox uses RDF too, a few simple SPARQL queries was all that needed to be defined. And again, the Bioclipse pluigin code base is pretty small. Second in the series (see #1), with two rather small tips. Java 5 introduced the method public boolean contains(CharSequence s), which can replace the more cryptic use of indexOf() != -1. Quite a long time ago, Jmol developer Miguel introduced me to a nice performance hint with respect to using logging tools. Each debug(), info(), warn(), etc method should take more than one parameter, so that only when debugging (or the debug level) is turned on, the objects are concatenated. It indeed gave a considerable performance boost to things. The CDK supports this too, and you should not concatenate Strings and other objects, but let the LoggingTool do that. ac.getAtomCount() + " atoms left." 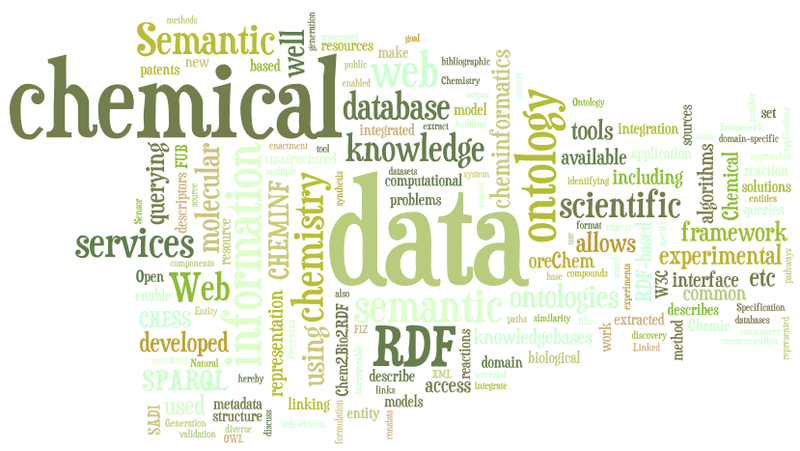 As you know from my blog, one of the things I am working on is to push RDF functionality in Bioclipse, as I believe it to be the missing link between molecular chemometrics and literature, databases, and other non-numerical information sources. 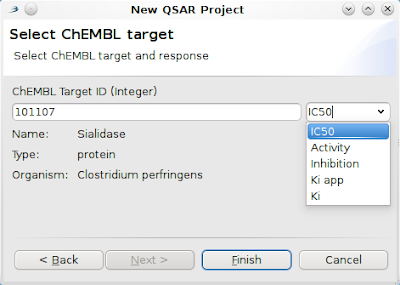 As part of the submission for the SWAT4LS special issue in the new Journal of Biomedical Semantics, Ola hacked up a cool wizard that sets up a new QSAR Project by downloading data directly from our RDF node for the chEMBL data using SPARQL. The paper is based on the SWAT4LS talk I gave, and the proceedings paper that recently appeared. But with more cool stuff, such as this cool RDF graph browser that allows you to open up molecules from the RDF graph in a JChemPaint editor. I'd like to announce first alpha version of OOChemistry. It is an extension for OpenOffice.org which provides cross-platform OLE-like integration of OOo with JChemPaint chemical diagram editor. With OOChemistry you can draw structure, embed into document (text or presentation) and than double click and edit whenever you want on any platform having OpenOffice.org and Java Runtime (Windows, Linux, Mac OS X, other Unix flavours). Remember that it's only alpha and is not recommended for production use (e.g., compatibility with futher versions is not guaranteed). OOChemistry needs your help! Experience in Java, in development of projects dealing with JChemPaint/CDK, or in development of OpenOffice.org extensions will be highly appreciated. Of course, you can help not only in coding, but also in translation of interface and writing docs. Your feedback as well as coding contributions are very much appreciated! I am excited about seeing chemical editing facilities in OpenOffice.org, and while the integration is not as good as Chem4Word, it is something I can run on my Linux system. The list of patches furthermore contains an update of the PubChem reader to support reading of additional fields, and the support of the CML @ref attribute in CMLReact (doi:10.1021/ci0502698). But the most interesting bit of this release is to me, that the last few patches are now reviewed and applied to make CDK-JChemPaint compile against a off-the-shelf CDK release (1.3.3 or higher :). This is a new category too, and created using the command git log cdk-1.3.2.. | grep Signed-off | cut -d':' -f2 | cut -d'<' -f1 | sort | uniq -c. Not every reviewer signs off commits, and no one other than the current commit right owners actually do this. Everyone is more than invited to check the patch tracker, and review patches give comments if you feel the patch can be improved, or sign it off otherwise (git commit --amend --signoff), which gives the other reviewers some idea of the state of the patch. Rajarshi did most of the reviewing work of this release; his contributions are very much appreciated. Jonathan worked this week on new features for the Bioclipse RDF editor (see these two earlier items). This version still does not edit, but only display using Zest. Jonathan created for me an extension point so that anyone can make the editor aware of domain objects, by simply registering the extension implementation along with the rdf:Class URI of the rdf:type of an object. This fixes the problem of having to hardcode dependencies of the RDF editor on all the domain code, as was the case earlier. 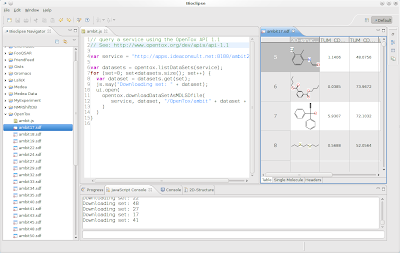 For example, double clicking the ron:mol2 node, would open up a JChemPaint editor.